HELP! Inxs’ lyrics talk of losing direction and hoping tomorrow will bring a better day. I too am in need of direction and hope that unpacking Inquiry Based Learning (IBL), using Boolean Operators and various databases, will bring me direction and a brighter day. So how do you go about unpacking a theory or methodology? In this instance, reflect on unpacking after a vacation and how tedious, yet memorable the disassembling of the bag minutiae can be – the shared experiences, new encounters and new learning can all come flooding back by picking up a single item. It’s a time for reflecting on the old (must discard those socks), the new, and steps you took along the way. 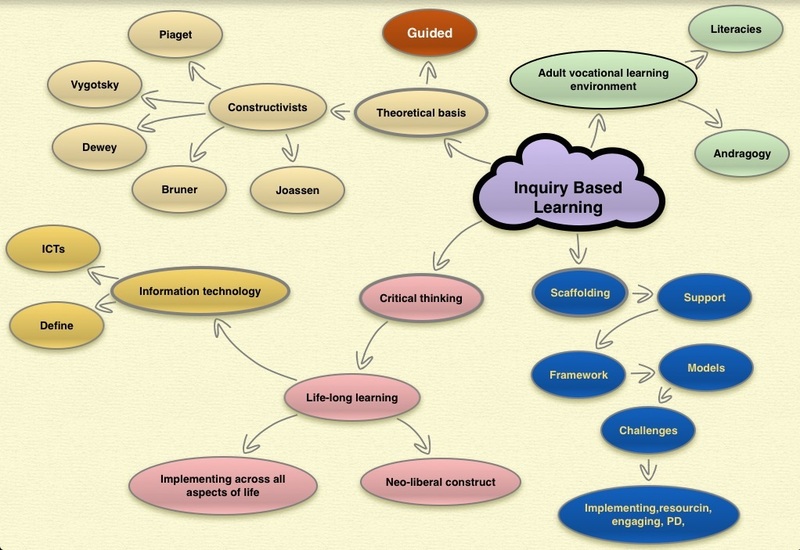 Unpacking Inquiry Based Learning may not be the aftermath of that long awaited vacation, however, it has shared experiences, new discoveries/learning and reflection on the steps implemented to achieve a solution or outcome. Reflection is a dominant element of this process and supports learning through critical thinking skills. This was not an exhaustive search for references relating to the criteria listed in my mind map, however, it was detailed, rewarding (at times a little frustrating), and time-consuming. What did I learn from this task? Boolean Operators are extremely useful if used effectively. At times I felt like I had “L Plates” strapped to my back and I was in a tail spin with the pedal firmly planted to the floor. To solve that dilemma I consulted the ever present YouTube videos on how to conduct searches using Boolean Operators in order to move to a “P Plate” (provisional) searcher. Yes this was successful, I learnt a few truths on how to use Boolean Operators, and I’ve now created my own how to video demonstrating one of my searches. View the video (below) to see the outcome. (Sorry for the sibilant overtones. Suppose a career change to doing voice-overs is out of the question.) From my searching I also verified a long held belief that the web is littered with articles which have not been critiqued. Some articles have been rigorously reviewed while others, well let’s just say, the lack of any referencing or links to sources had me packing my bag. This experience was as much about unpacking Boolean Operators and search terms and/or phrases as unpacking IBL. I hoped that consulting the Tips section for ProQuest would give me greater insight and refinement for conducting searches, however, the SU.EXTRA (inquiry based learning) search produced zero results. I will pursue these tips in the hope I can locate articles to support my research.